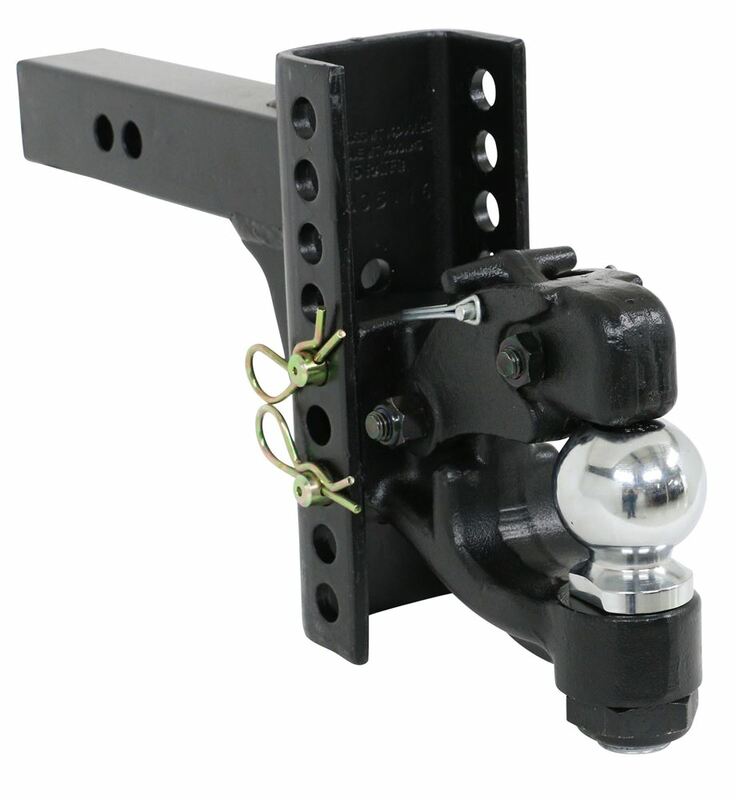 Pintle hook and 2-5/16" hitch ball combo lets you hook up heavy-duty trailers of various heights to your tow vehicle. Towing capacity 13,000 lbs. 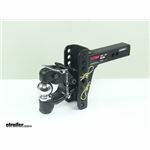 Call 800-298-8924 to order Curt ball mounts part number C45910-15-20 or order online at etrailer.com. Free expert support on all Curt products. 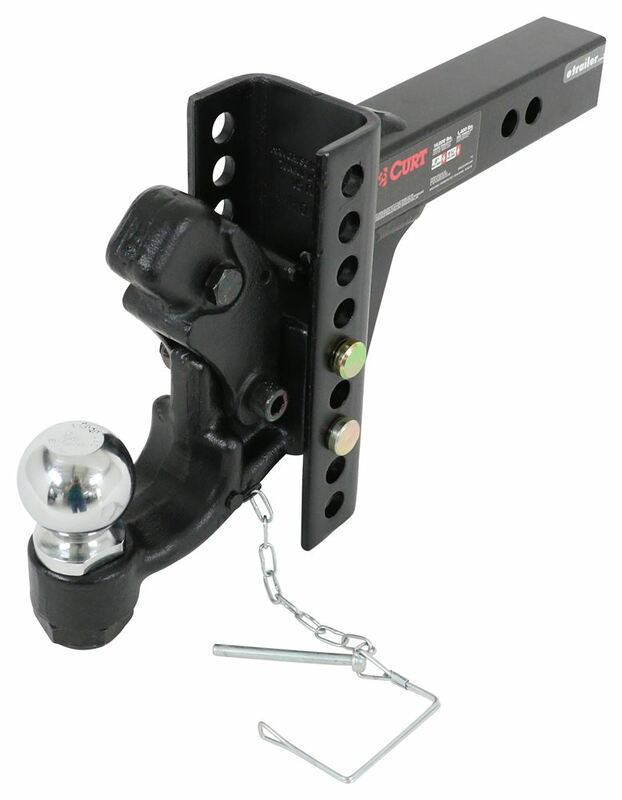 Guaranteed Lowest Price and Fastest Shipping for Curt Pintle Hook with 2-5/16" Ball - 2" Hitches - 13,000 lbs. Ball Mounts reviews from real customers. 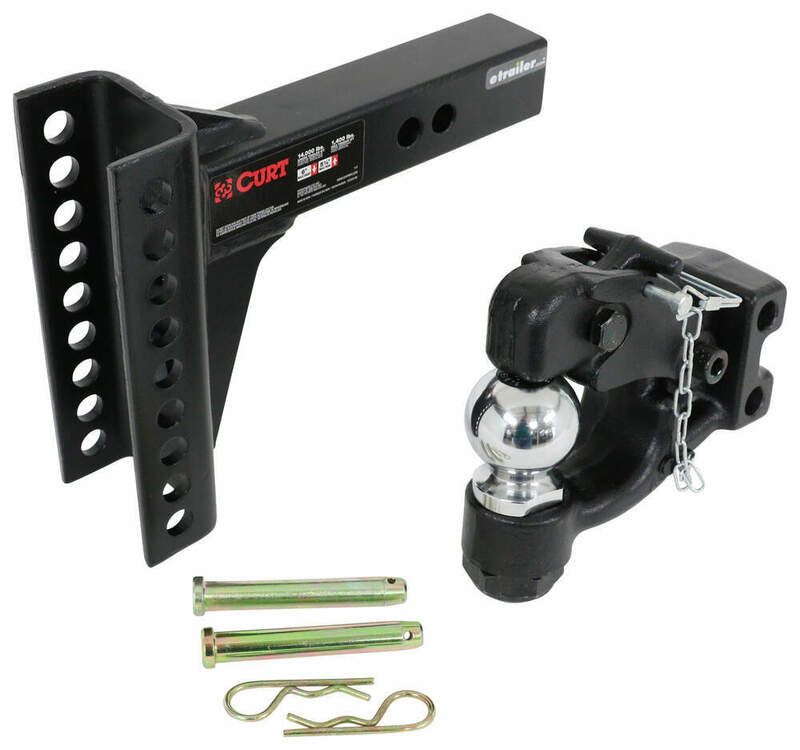 Pintle hook and 2-5/16" hitch ball combo lets you hook up heavy-duty trailers of various heights to your tow vehicle. Towing capacity 13,000 lbs. 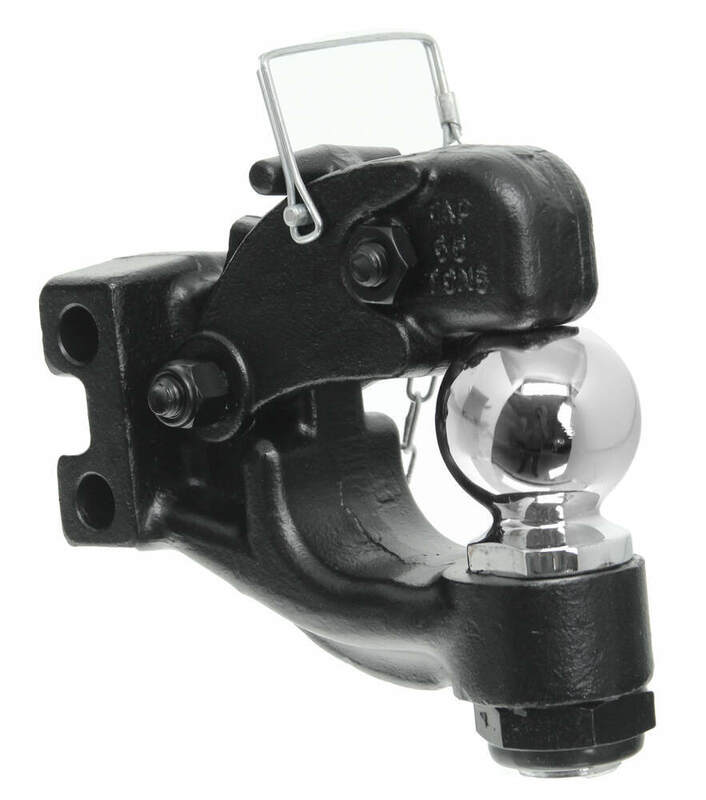 Lunette ring inside eye diameter: 2-1/2" or 3"
For your multiple towing needs, this ball mount has an adjustable height (from a 5-3/4" drop to a 5-3/4" rise), solid steel construction and 3, chrome-finished balls - 1-7/8", 2" and 2-5/16". 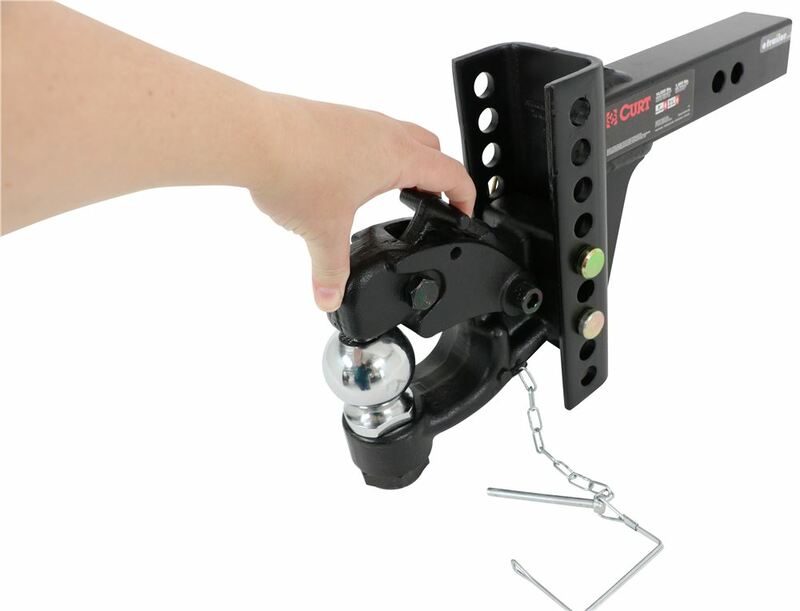 Pintle hook and 2-5/16" hitch ball combo lets you hook up heavy-duty trailers of various heights to your tow vehicle. Towing capacity 20,000 lbs. 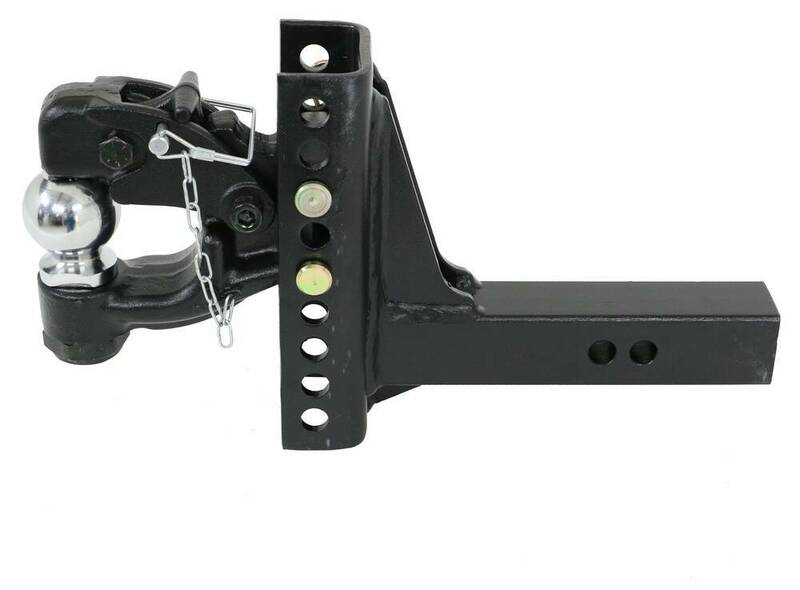 Insert this heavy-duty mount into your 2" hitch to get 5 stacked 2" receivers for mounting the included 2" ball, 2-5/16" ball, pintle hook, or other hitch-mounted accessory. 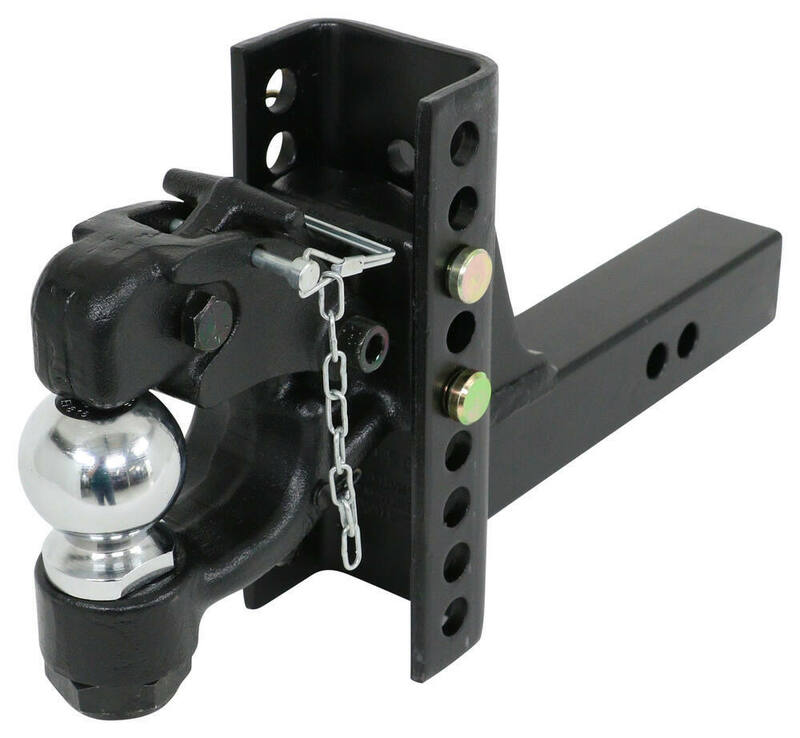 Order: RelevanceNewestRating - High to LowRating - Low to High Pintle hook and 2-5/16" hitch ball combo lets you hook up heavy-duty trailers of various heights to your tow vehicle. Towing capacity 13,000 lbs. Yes you sure can! The replacement pins that are used to adjust the hitch ball and pintle hook on the Curt # C45910-15-20 are found on our site listed as part # C45925. If you would rather go with a locking pic set I recommend the Curt Lock Set # C23556. This will replace one of those adjustment pins and then also be used to lock the shank of this ball mount to your trailer hitch receiver. 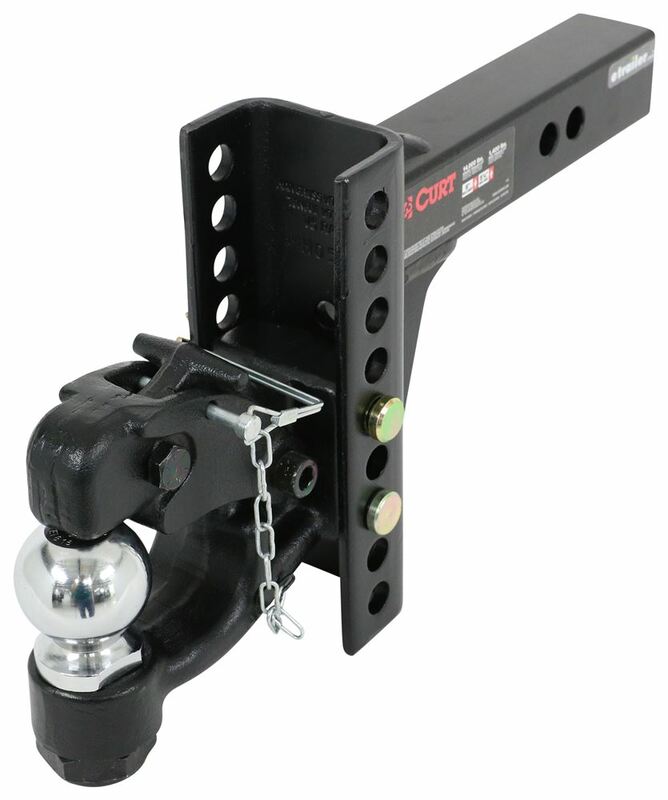 It sounds like you are looking for a pintle/ball combination hitch like the Pintle Hook Combo with 2-5/16" Ball # 63012. 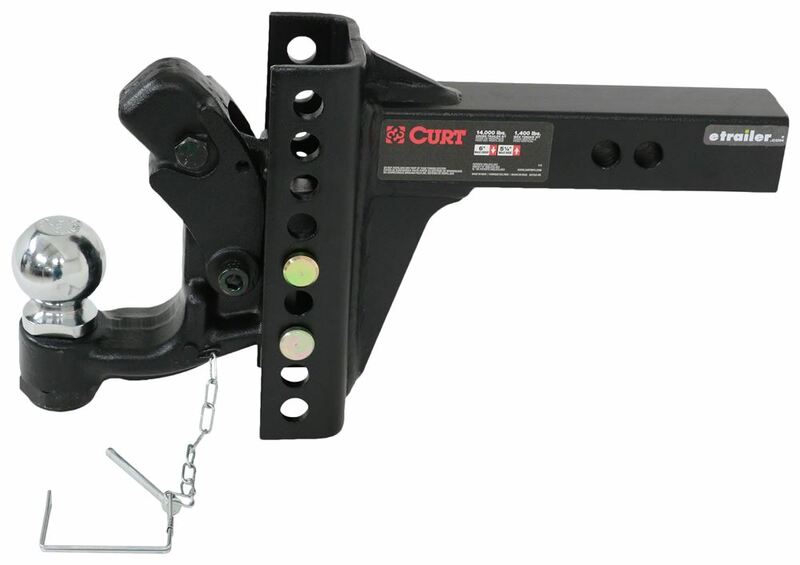 If you want a hitch mounted option, then you can use the Curt Pintle Hook with 2-5/16" Ball - 2" Hitches - 13,000 lbs # C45910-15-20. Either of these options are compatible with the lunette rings like # BD1291010383 but will also allow you to use a trailer coupler on the hitch ball. If I misunderstood what you were asking please clarify the question for me. 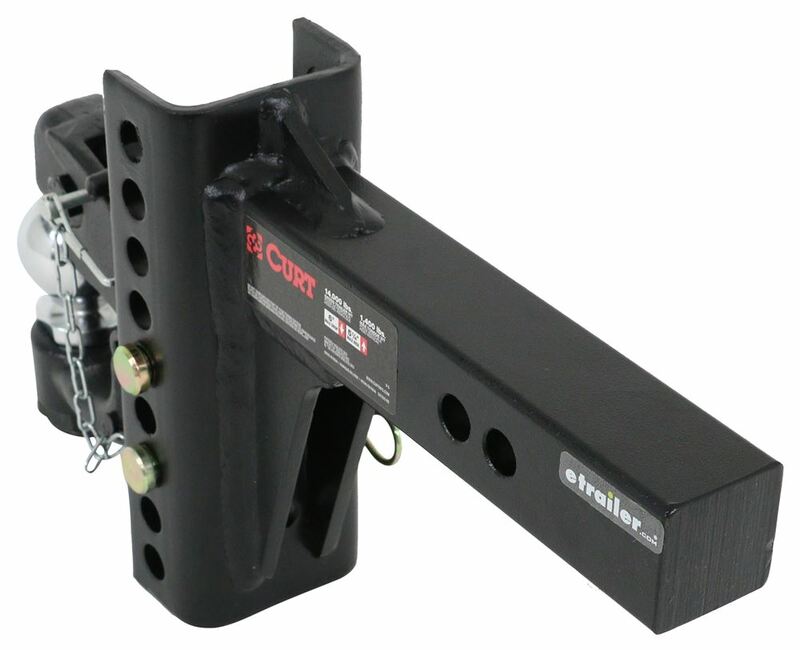 The Curt Pintle Hook with 2-5/16" Ball - 2" Hitches - 13,000 lbs # C45910-15-20 allows for 7 different heights within the channel. The adjustment is in 1 inch increments. This will allow for a maximum rise of 5-1/4 inches and a maximum drop of 6 inches. 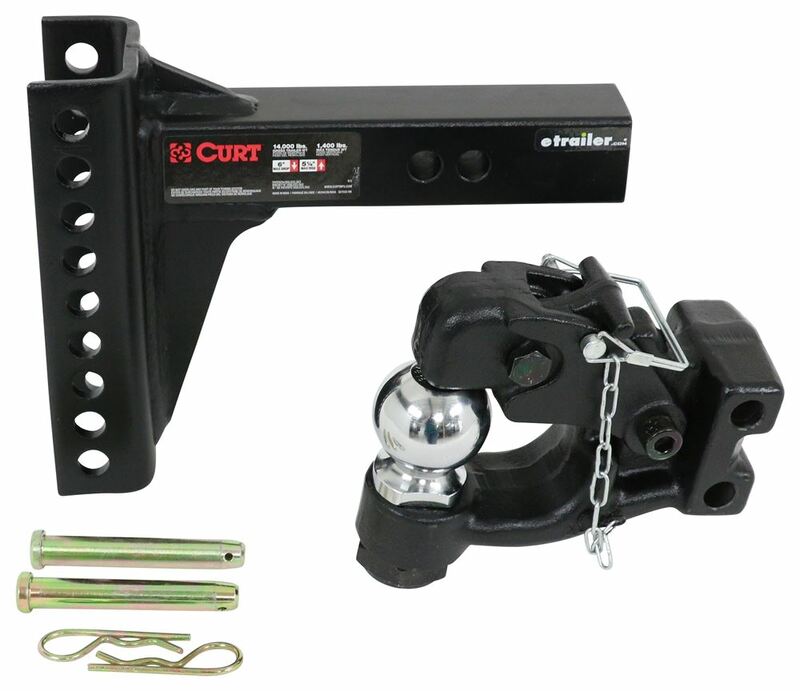 I recommend the Curt Lock Set for Adjustable Channel-Style Mounts # C23556 to secure both the adjustable pintle and ball but also the shank to your trailer hitch receiver. The Curt Pintle Hook, part # C45910-15-20, provides up to 5-1/4 inches of rise or 6 inches of drop. Overall the shank measures 9-7/8 inches tall. You should not have any trouble using the Curt Pintle Hook with 2-5/16" Ball - 2" Hitches # C45910-15-20. If you take a look at the linked demonstration video you can see that the pintle hook will not snap, and to open the pintle you will only need to pull the safety pin and pull on the T-handle. It is perfectly safe for any sized hands and simple to use. The shank portion of the Curt # C45900 is the same as the # C45910-15-20 so yes you could use just the pintle portion which is # C45920 if you wanted to convert it to a pintle. Yes, the Curt Pintle part # C45910-15-20 can handle 1,300 lbs of tongue weight. I attached a review video for more info as well. You will want to use the Curt Lock Set # C23556 to secure the Curt Pintle Hook with 2-5/16" Ball # C45910-15-20. One pin will replace one of the pins that comes with the pintle hook and the other can be used to secure the shank in your trailer hitch. Please note that any lock can be defeated given enough time and effort/resources. This is not necessarily theft-proof but it will do a great job discouraging anyone from just walking by and taking it. 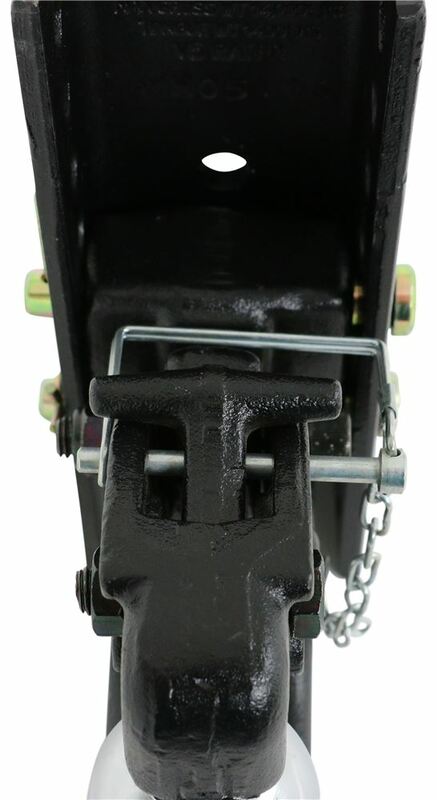 Everything you need to use the Curt Pintle Hook, part # C45910-15-20, is included except for a hitch pin. For a standard pin and cilp use part # C21500. If you prefer to lock the pintle hook to your hitch receiver use the Curt Lock Set, part # C23556, which includes 2 locking pins. One to secure the shank to your truck and one to secure the pintle hook to the shank. 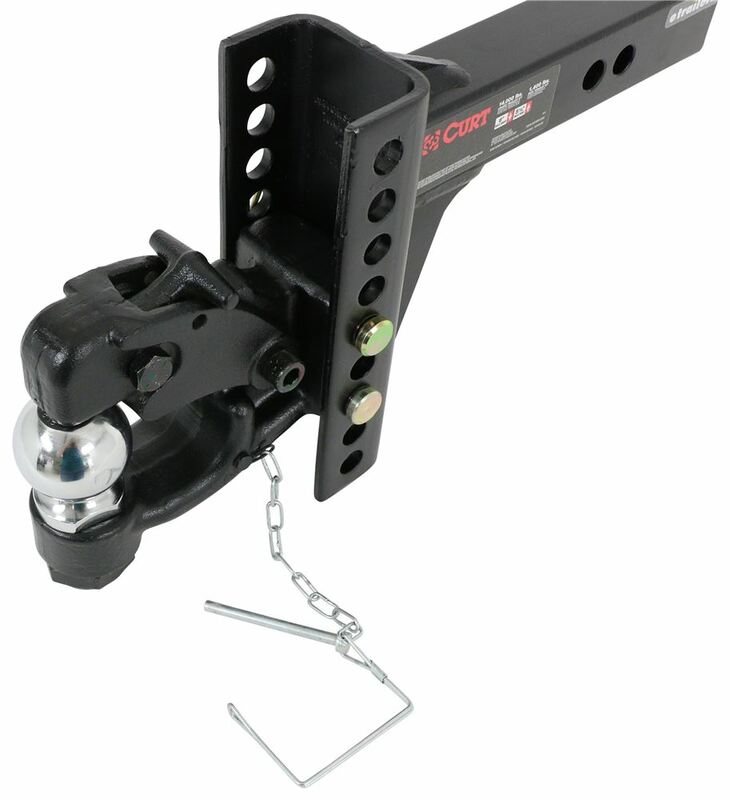 The Curt Pintle Hook with 2-5/16" Ball # C45910-15-20 has a weight capacity of 13,000 lbs. That applies to both when using the 2-5/16" hitch ball or the pintle hook. The Curt Pintle Hook with 2-5/16" Ball # C45910-15-20 that you referenced is rated for 13,000 lbs as the product page states. The shank, which is part # C45910, is rated for 14,000 lbs which you see on the sticker, but the channel mount, part # C45920, is only rated for 13,000 lbs. Since you don't want to exceed the weight limit of your least rated component the overall rating is 13,000 lbs. The Curt Pintle Hook with 2-5/16" Ball # C45910-15-20 that you referenced does has a max Rise of 5-1/4" and a max Drop of 6". You can adjust it in 1" increments. I have attached a review video for you to check out. Yes. The InfiniteRule Locking Pins for B & W Tow and Stow 10K and 14.5K Ball Mounts - Keyed Alike - Qty 4 # 34061701D have pin diameters of 5/8 inch and spans of 4-3/16 inches and 3-1/8 inches. 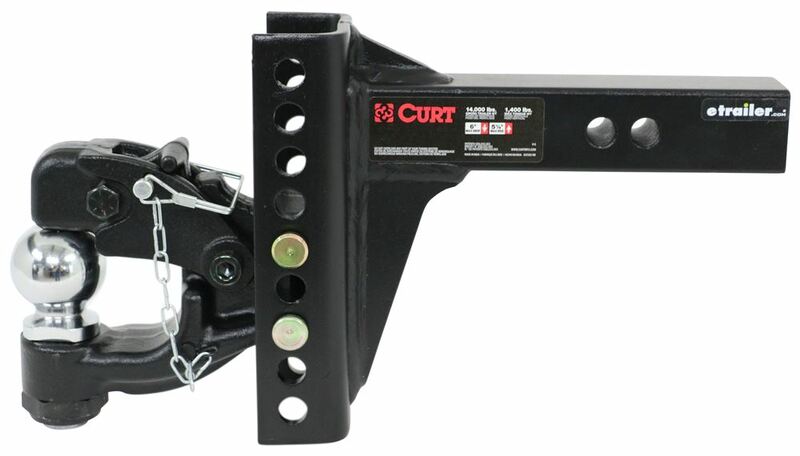 The Curt Pintle Hook with 2-5/16" Ball - 2" Hitches - 13,000 lbs # C45910-15-20 uses 5/8 diameter pins that are 4-1/4 inches 3-1/4 inches based on the designed locks # C23556. The Infinite Rule Locking pins will absolutely work for this application.